Yes, you can get ripped, torn, or snagged suit pants and suit jackets fixed. This type of suit repair is called reweaving — or invisible mending. Have a hole in your suit pants or suit jacket? Two ways to avoid having to get your suit pants and jackets reweaved. Where you can get reweaving done, if you need suit repair. I think it’s important for men to understand that dress clothing — whether it be ready made or custom tailored — is an investment at any price point. #1 – If you know that your work day consists of spending time in factories, manufacturing facilities, or any place that would expose your clothing to possible rips, tears, or snags — I suggest you wear a casual dress pant instead of a suit pant that if ripped, torn, or snagged won’t cost you the loss of an entire suit. Likewise, if your job requires you to entertain customers and clients in the evening at sporting events (such as baseball, football, basketball, etc. )… unless you are in private seating, those stadium seats can be a hazard. Replacing a casual dress pant at $125 to $300, plus a blazer or sport coat at $300 to $800 is painful enough. The cost to replace suit pants and/or a suit jacket would be much more than that. So, if you know in advance your schedule of events, then dress accordingly. TIP: If your job requires a suit and tie every day, I recommend that you keep a navy solid blazer or black solid blazer with a coordinating trouser and shirt at the office — so you’re always prepared. #2 – Another solution that requires a little more investment on the front end during the purchase of a suit is to buy your suits with a second pair of matching pants! This option is available in ready-made suits if the manufacturer offers “suit separates”. If you’re buying custom clothing, then it’s always an option to buy a second pair of suit pants that match. 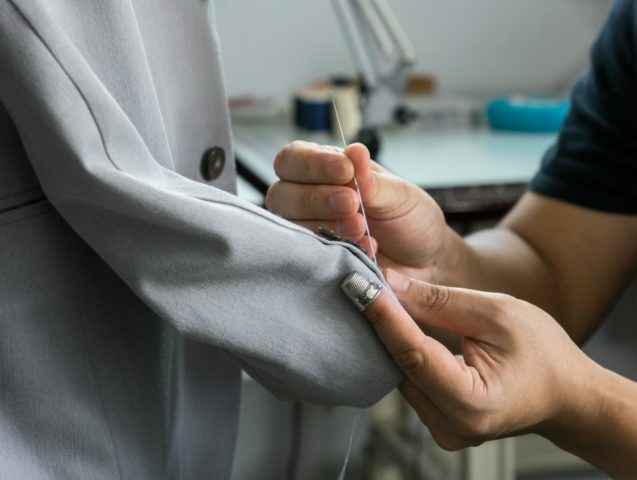 While reweaving suit pants, suit jackets, and sport coats is becoming a lost art and takes a very skilled tailor or weaver to accomplish it, there are still a remaining few that do invisible mending! How much does suit reweaving cost? Plan on paying anywhere from $60 to $100 per garment, depending on the size of the hole that’s being repaired. The turnaround time for suit repair and reweaving is typically 2 to 4 weeks. Some rips, tears and snags may not be worth reweaving — especially if they’re in places that are easily visible. TIP: It’s very important to always dry clean your suit pants and jacket together — to maintain color consistency. Even though you can successfully have your pants or jacket reweaved, if you haven’t maintained the dye in the wool by dry cleaning them together, the reweaving will show because of the color difference in the garments.